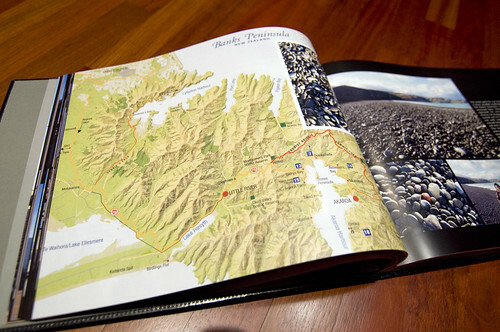 Including a map in your travel photo books is a great way to not only illustrate where your journeys have taken you, it makes for a visually interesting graphic to add some punch to your design. I love anything featuring maps or globes (I decided on a travel theme for Photo Book Baby’s nursery.) and that goes for my photo books as well! 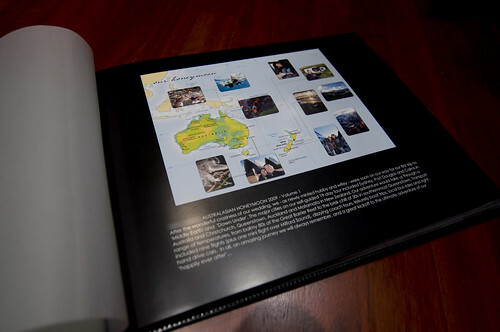 1) Scan a map – This one shows a simple layout from one of my honeymoon photo books. It’s just a scan of a map I found in a free travel brochure. I added a small inset photo. It’s an easy way to give context to the photos that follow. 2) Overlay of Photos – This one took a bit more time to make but was well worth it. I designed it as part of the thank you card for our wedding. It shows a map of the countries we visited along with a photo taken in each of the cities we stayed. It may be hard to see here, but there are small dotted lines connecting each photo to its matching city. I’m all about repurposing things so of course this map was perfect to put on the title page of my honeymoon photo book as well. 3) Add Some Symbols – This is a map I made recently of a Disney cruise to Alaska. We got to enjoy Vancouver for a couple days before boarding the ship – the purple hearts show the places we visited. You can basically make your own “legend” and personalize it any way you like. You don’t need any special design software to do something like this – you can do this in most photo book software. Just scan a map and then use available clip art for the symbols. The text is added just like you would a caption. 4) Map Tool – Apple’s Aperture and iPhoto have a built-in map tool that detects where your photos were taken, or you can add the cities on your own which makes it very easy to include a nice looking map. There are several different map style options as well. 5) Map Your Life’s Travels – Do you have a bucket list of places you’d like to visit someday? This may be a fun item to include in your travel photo books. You can generate a map with all the places you’ve visited and add to it along the way – putting it at the end or beginning of each travel photo book. There are several free map generators I’ve seen online, but since I haven’t done this yet, I can’t recommend a specific one. Sounds like a fun idea though right? You can also do variations on this theme like places you’ve visited with your significant other (for an anniversary book perhaps?) or places you’ve lived. One reader making a book about her childhood said she was going to include a map of her childhood home. That’s a creative idea isn’t it? I would never think to do that – it’s such a great idea. Well I hope you’ve picked up some ideas for your photo books! It’s inspired me to get working on another! This is such a neat idea. I know I have put maps in my books, but usually a simple map to show where it is and that’s about it. I’ve been on a 2 years break from photobooks, it’s about time to pick it up again! Perfect timing for me and this post! Thanks for the tips PBG – i am struggling to find a way to map out the route i took on a 3 week excursion in Japan just to emphasize the distance i travelled between each place in such a short time! My iphoto is a pretty old version but i too collect free brochures in abundance and maybe can utilize them instead! Glad it was timely 🙂 good luck with your books! I’ve only been to Toyko – would be nice to see other cities. It’s such a beautiful country! I love to use maps. I am working on my father’s story of his time as a Navy Chaplain in Japan after the atom bomb. He ministered in about six different cities there and I am highlighting them on a map. I also want to include a family tree.I know that some photobooks offer family tree pages and others don’t. Any one know of a place to create a family tree that can be saved as a jpeg or printed out to scan that is independent of a photobook? Thanks. I found this post (and your whole blog) by searching for a good website to create a map for a current photobook I’m working on. This post seems a bit outdated, therefore I wanted to ask if you have been able to find any good websites that assist in creating travel maps that don’t look like google maps at the same time, but have more of a travel brochure style to them. Your ideas are great, but I need something that would incorporate several countries. So far I only found stepmap.com that is doing something similar to what I’m looking for, but they are not ideal. Any suggestions would be great, thank you in advance!